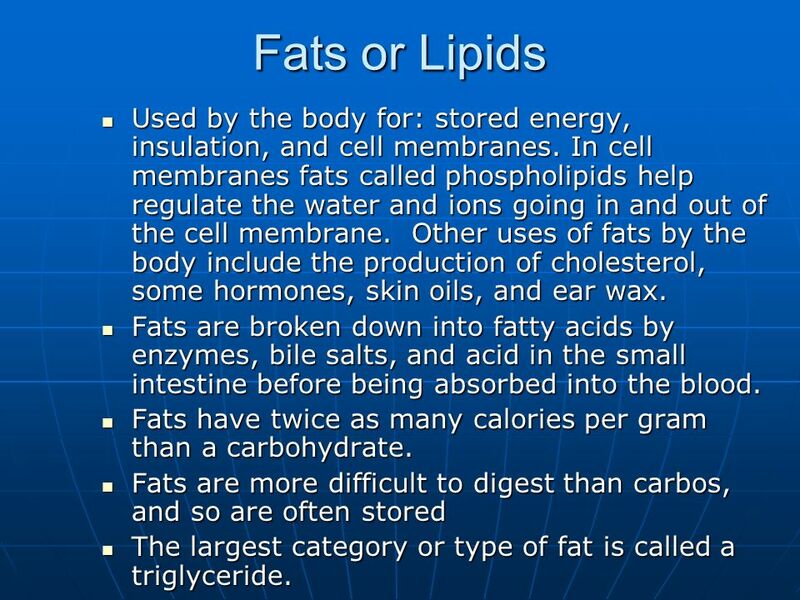 2 Fats or Lipids Used by the body for: stored energy, insulation, and cell membranes. In cell membranes fats called phospholipids help regulate the water and ions going in and out of the cell membrane. Other uses of fats by the body include the production of cholesterol, some hormones, skin oils, and ear wax. Fats are broken down into fatty acids by enzymes, bile salts, and acid in the small intestine before being absorbed into the blood. 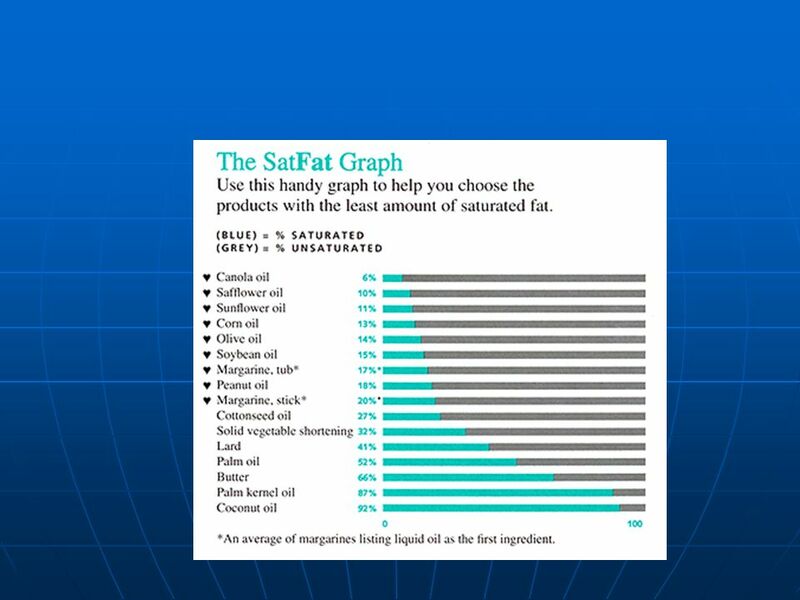 Fats have twice as many calories per gram than a carbohydrate. Fats are more difficult to digest than carbos, and so are often stored The largest category or type of fat is called a triglyceride. Saponification or making soap. 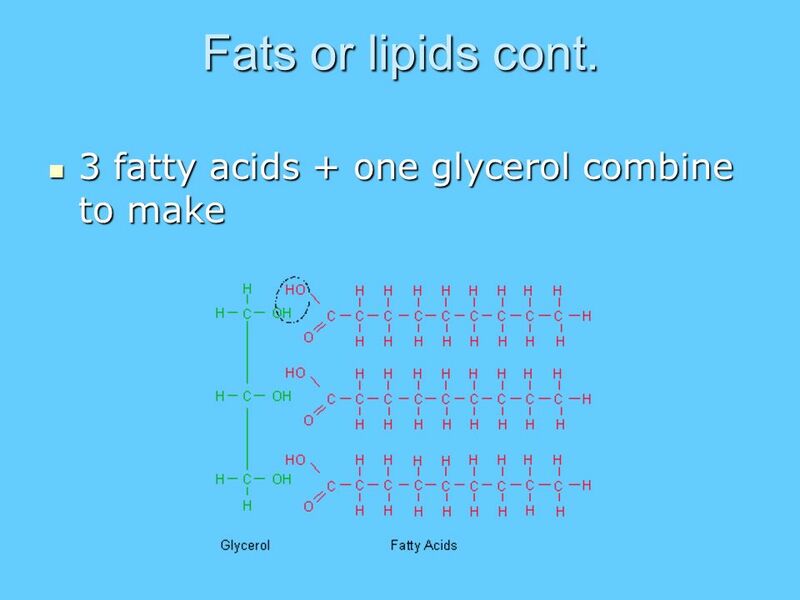 Uses a fat (lard or oil) and NaOH Heating the fat with NaOH causes the triglyceride to separate into a glycerol molecule and 3 fatty acids. The fatty acids are molecules with a polar head and nonpolar tail which means that they can intersperse among both polar and nonpolar substances. 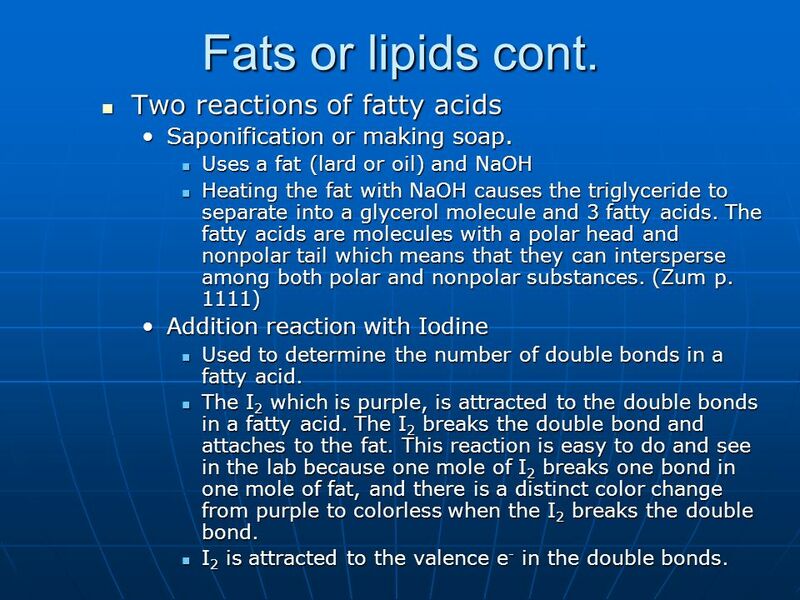 (Zum p. 1111) Addition reaction with Iodine Used to determine the number of double bonds in a fatty acid. The I2 which is purple, is attracted to the double bonds in a fatty acid. The I2 breaks the double bond and attaches to the fat. This reaction is easy to do and see in the lab because one mole of I2 breaks one bond in one mole of fat, and there is a distinct color change from purple to colorless when the I2 breaks the double bond. I2 is attracted to the valence e- in the double bonds. 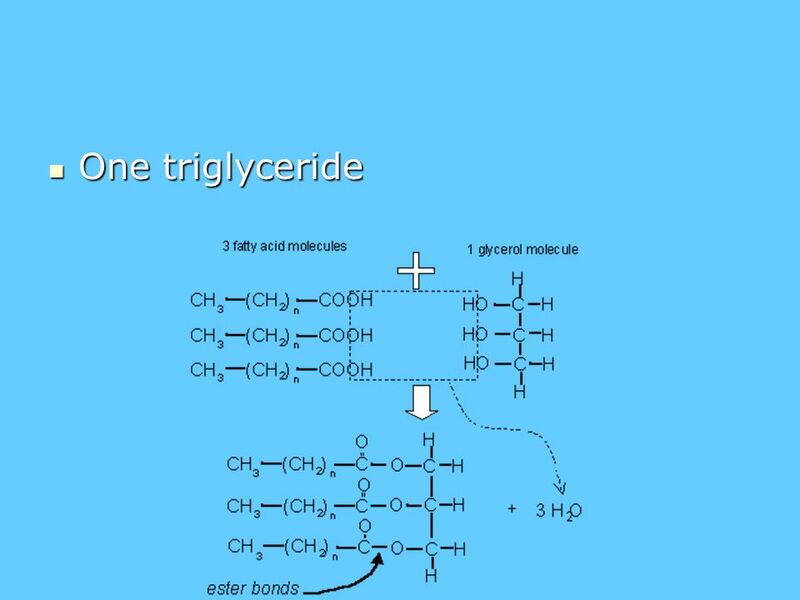 Triglycerides consist of 3 fatty acids and one glycerol molecule. 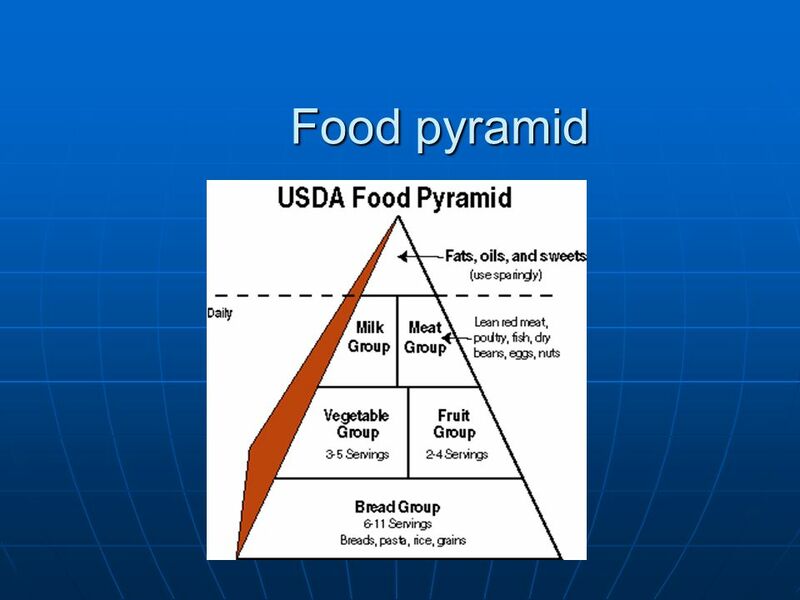 If one of the fatty acids is saturated than the triglyceride is considered to be a saturated fat. 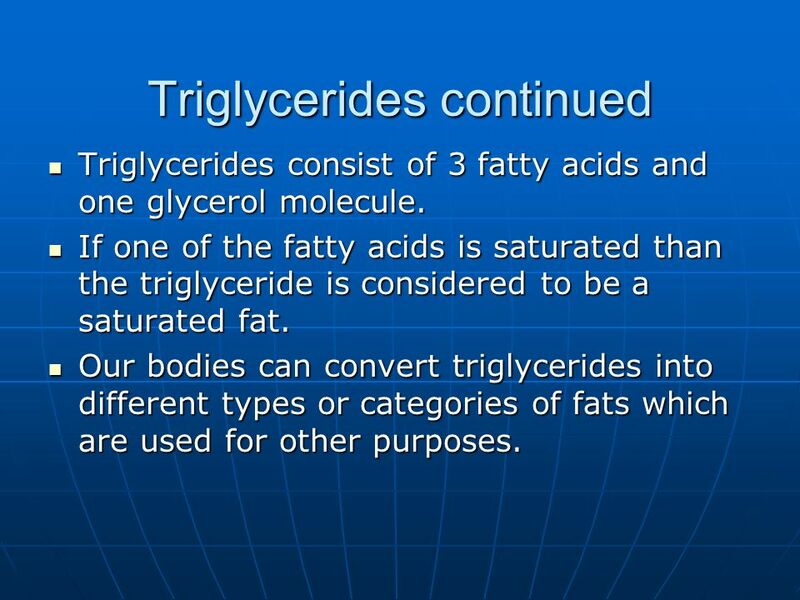 Our bodies can convert triglycerides into different types or categories of fats which are used for other purposes. 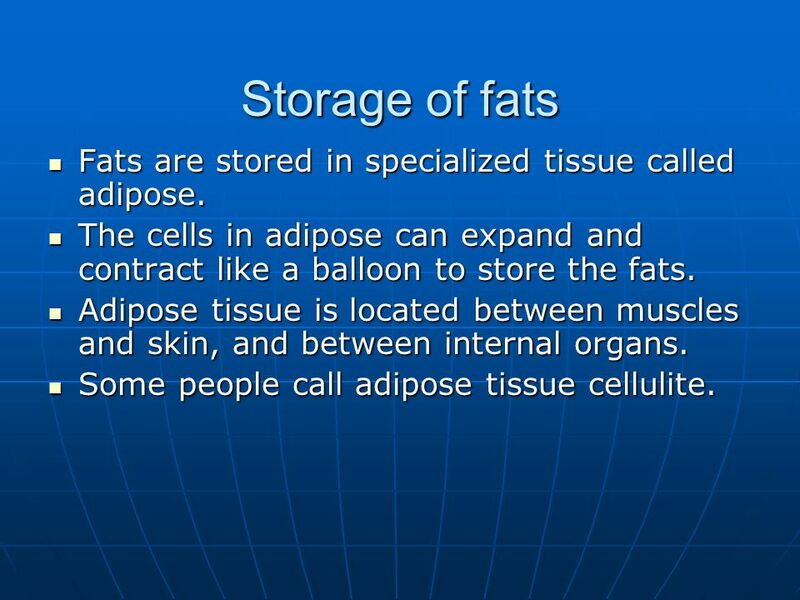 9 Storage of fats Fats are stored in specialized tissue called adipose. 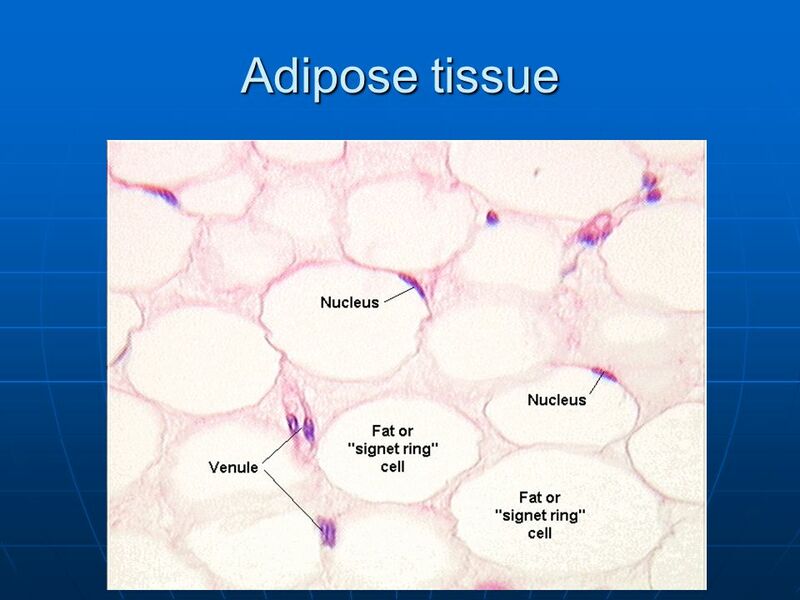 The cells in adipose can expand and contract like a balloon to store the fats. 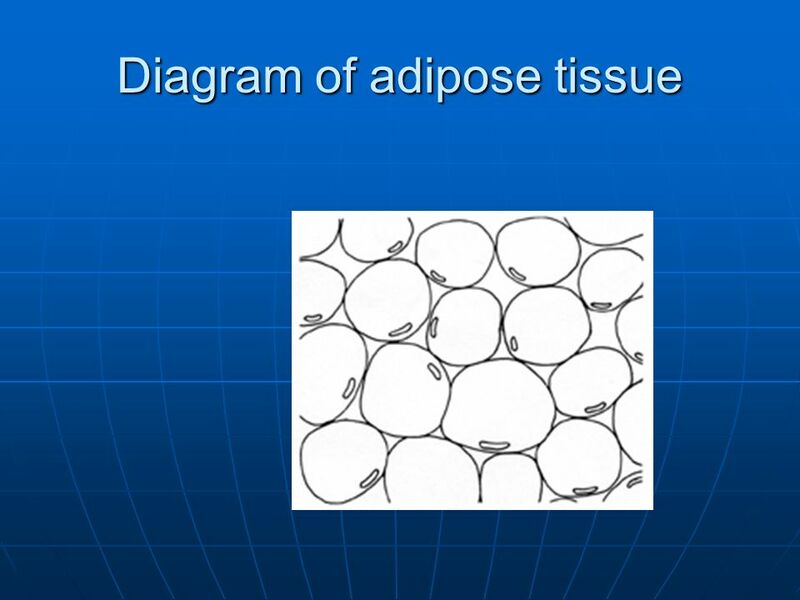 Adipose tissue is located between muscles and skin, and between internal organs. Some people call adipose tissue cellulite. 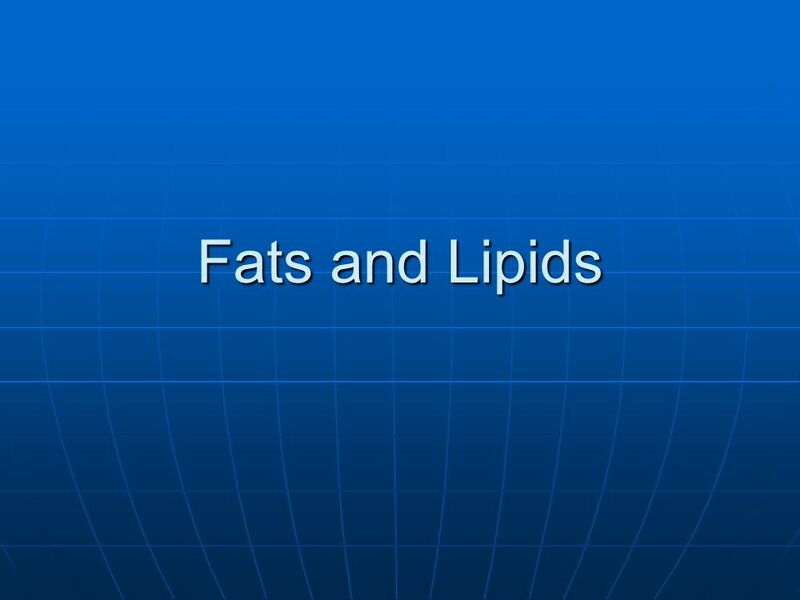 Download ppt "Fats and Lipids." AP Biology Intro to Organic Molecules & Lipids AP Biology Life is based on Carbon Carbon atoms are versatile building blocks Special bonding properties. Chapter 13 Lipids Chemistry 20. Lipids - Family of bimolecules. - They are soluble in organic solvents but not in water (nonpolar). 1. Store energy: fat. 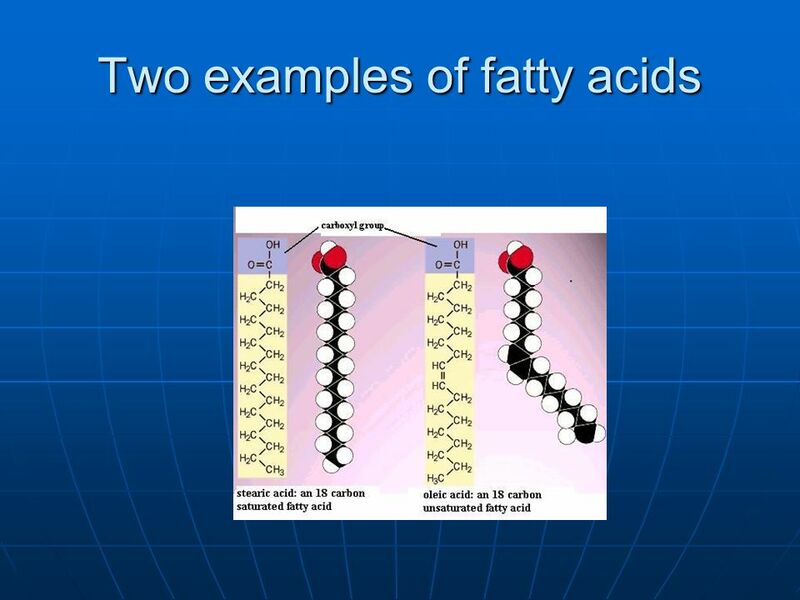 AP Biology Lipids: Fats & Oils AP Biology Lipids energy storage. When you think of the word FAT what do you think of ? Chapter 21 Lipids Chemistry B11. Lipids - Family of bimolecules. - They are not defined by a particular functional group, thus they have a variety of. 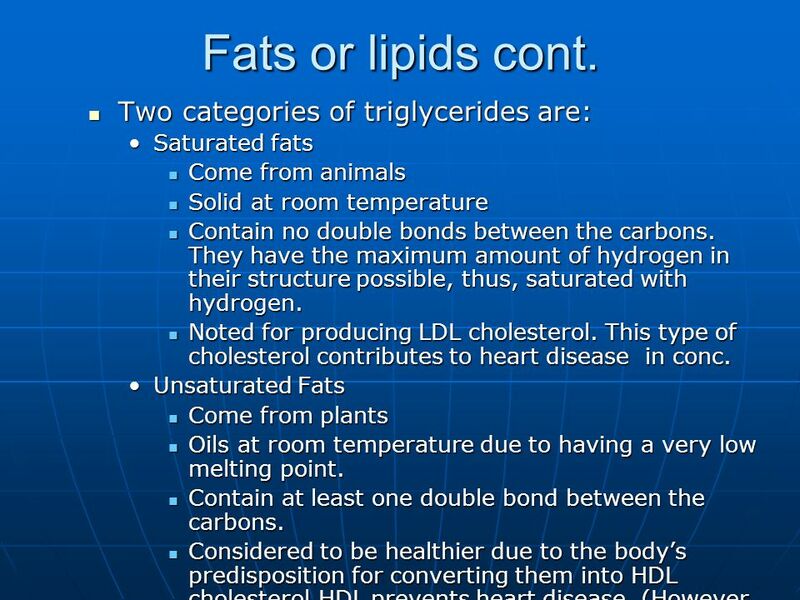 LIPID REVIEW Dr. E. Lipids A. Hydrophobic B. Hydrophillic C. Nonpolar D. Polar E. Both A & C F. Both A and C.
Lipids: Fats & Oils Lipids Large biomolecules that are made mostly of carbon and hydrogen with a small amount of oxygen (sometimes. Lipids Mr. Chapman Biology 30. LIPIDS. Hydrophobic, non-polar molecules Used for energy storage, building membranes and chemical signalling Four main types: fats, waxes, steroids and.  Also known as fats  Made of carbon, hydrogen, and oxygen  When your body breaks down lipids, it turns it into fatty acids and glycerol.